The blond-haired girl was lost in a storm, a Florida rain shower that sprang up fast and furious. The road rose to meet her with each flash of lightning; a clash of thunder made her leap like a frog on a lily pad; everything around her swayed in the shadows. The red outfit clung to her body like Saran wrap, raindrops pelted her skin like flying spit balls, and pain gnawed at her gut from the fear. Mostly she was terrified of the huge limbs that lined the street. 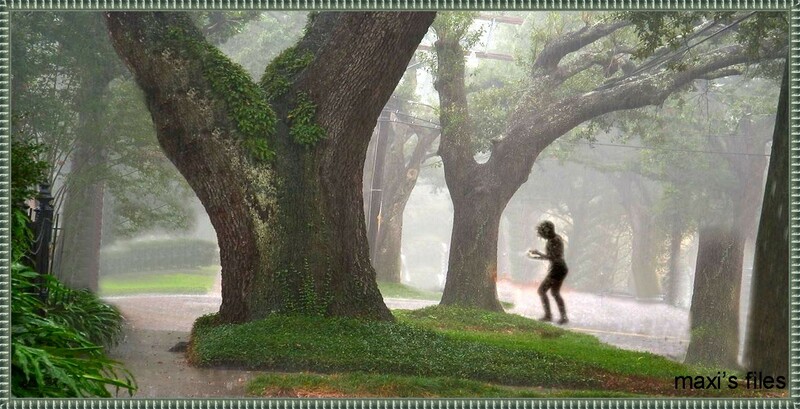 The thirteen-year-old heard that lightning always struck the trees. She felt like the dot in the middle of a target. She had to find a way out of this neighborhood, onto a main road. A place that looked familiar, where she knew the street signs. This wouldn’t have happened if she wasn’t afraid to speak up, to ask questions. Like where to find the right bus. Only she was too scared to talk to a stranger, and got on the wrong bus. Her blue eyes searched for a way out, all the way to the end of the line. The frightened girl wanted to tell the driver that she was lost, only she couldn’t. The words just wouldn’t come. As the door closed behind her, tears were at the surface. Where am I? How will I get home? That is when she created her first quote: One foot in front of the other will take you anywhere. Four hours later Maxi made it home. This entry was posted in Weather and tagged aviation, cars, Delirious?, Florida, florida rain, LBC, Maxi, Obsessive–compulsive disorder, old fossil, Ramana, saran wrap, Transportation, Will Knott. Bookmark the permalink.